A decade has passed since Bettina Piko wrote a paper called: Physicians of the future: Renaissance of polymaths? I read this at the time with great fascination having been particularly inspired by a lecture given in London by Dr Raymond Tallis on dementia which went beyond the current focus on neuroscientific research. At the end of his talk, and after Dr Tallis had left the lecture theatre, one of the facilitators, a leading doctor and expert on dementia, commented that Dr Tallis appeared ‘distanced’ from ‘biological reality’. My conclusion was that Dr Tallis’ breadth of consideration was essential. 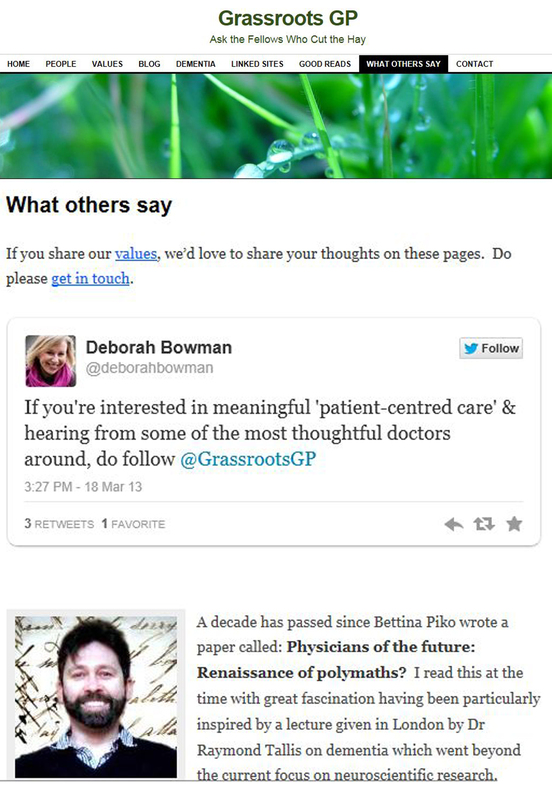 I mention this as my introduction to the Grassroot doctors was also through the consideration of dementia. I have come to appreciate the breadth of knowledge, ability and compassion in this group of doctors. This Grassroots venture is one that would truly cheer Dr Piko, but also I have discovered represents practical and intelligent wisdom that will, I am quite certain, bring better care for us all.